Deluxe Indulgence is a tempting combination of orchard fresh fruits variety such as Plums, Apples, Banana, Wiliam Pear, Sharon Fruits and more. You can choose this superior design of fruits basket beautifully wrapped with a checked ribbon, for your lovely family, friends and relatives to give them heartiest greetings. This fruit basket is a perfect gift for any grand occasion such as Birthday, Anniversary, or Christmas. 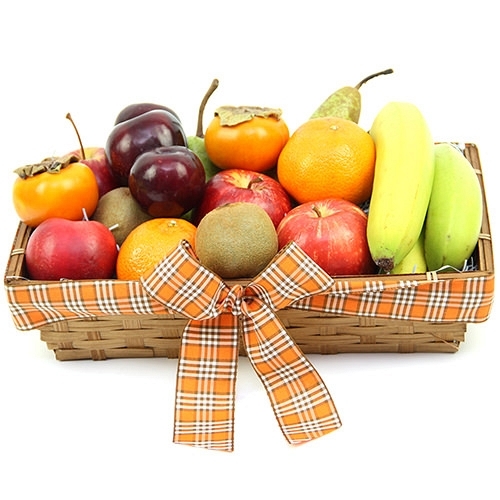 Send Deluxe Indulgence fruit basket by post to UK with your personal message card attached.